The zoo turned 50 in 2015! Click here to join us in remembering special zoo moments from the past five decades, and know that your support has helped to make them happen. At the Fort Wayne Children’s Zoo, kids can get nose to nose with a goat, families can explore a misty jungle trail, and giraffes roam a vast grassy hillside. The zoo is internationally recognized for its innovative displays, award-winning animal exhibits, and well-manicured grounds. Local residents embrace the zoo as a great place to spend a sunny afternoon. But, this world-renowned zoo had humble beginnings. In 1952, 54 acres were added to Fort Wayne’s Franke Park to establish a nature preserve. Animal displays included four monkeys, a black bear, three wildcats, deer, mountain goats, raccoons, foxes, porcupines, pheasants, ducks, swans, and an American eagle. 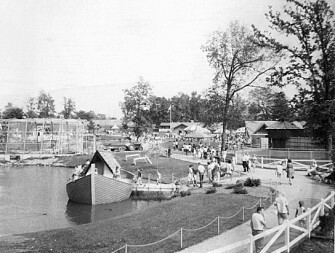 The popularity of the nature preserve encouraged local officials to consider building a full-fledged children’s zoo. By 1962, the planned exhibits included an Indian Village, a prairie dog colony, mammal dens, hoofed animal areas, and Noah’s Ark. The zoo would be run by a staff of three, with seven employees added during the busy summer months. Plans in hand, the city’s Board of Park Commissioners appointed a 65-person Advisory Committee to foster interest in the zoo and raise money. Fort Wayne rallied behind the project. Within three years, the committee raised $350,000 and secured $200,000 in donated materials and services. By 1963, preliminary site work was underway. Local tradesman donated their time to install utilities while “zoo boosters” from age two to 12 collected pennies to buy an elephant. Community groups sponsored animal exhibits. Earl B. Wells, then a young zoo director in Rochester, New York, was hired in 1964 to supervise the new Children’s Zoo – a position he held until his retirement in 1994. On July 3, 1965, the $500,000 Fort Wayne Children’s Zoo, comprising five and one-half acres and 18 exhibits, opened to the public. Attendance that first day was 6,000. From the start, the zoo was one the nation’s few self-supporting zoos, earning all revenue from admissions, rides, and concessions. The Fort Wayne Zoological Society was established in 1966 as a nonprofit organization to assist in the development and growth of the zoo. To raise funds, the Society sold season passes to the zoo and sponsored member-appreciation events such as the “Zoo-Loo-Au” picnic, two services that continue today. By 1967, Amos, a rare bonobo (pygmy) chimpanzee, was the zoo’s most popular resident. He rapidly became the zoo’s mascot and goodwill ambassador. For a time, Amos’ portrait graced the zoo logo. 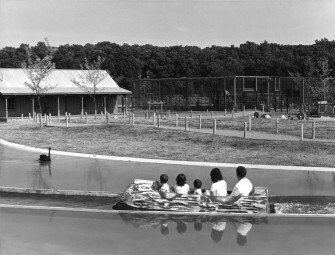 The zoo opened on July 3, 1965. Amos the bonobo chimpanzee was a popular zoo resident in the 1960s and 70s. In 1969, Director Wells established the Zoomobile program, which visited every third grade classroom in Allen County. Over time, this educational program grew along with the city, from visiting 50 classrooms in 1969 to nearly 400 in six counties in 1999. Programs like this only increased the zoo’s popularity. By 1971, the zoo enjoyed an annual attendance of more than 286,000. In 1971, plans were unveiled for an exciting addition to the zoo: the African Veldt. The Veldt would use architectural elements, such as thatch-roofed huts and stick fences, to “immerse” visitors in the African theme when it opened in 1976. 1976 also marked the first Christmas Time at the Zoo, a Fort Wayne tradition that continued through 1994. The zoo was adorned with thousands of lights, Mr. and Mrs. Santa Claus, and storybook characters. Meanwhile, zoo animals visited playgrounds, nursing homes, and the children’s ward at Parkview Hospital. Zoo education programs grew to include tours, presentations, and a weekly 30-minute “Zoo’s Who” television program. The Fort Wayne Zoological Society became one of the largest in the nation, with a membership of 6,186 families. In 1979, another tradition came alive: the Great Zoo Halloween. Thousands of pumpkins were carved and painted to transform the zoo for this event. By 1982 there were about 550 animals in the zoo, with 12 permanent staff and 50 seasonal workers. Nearly 100 volunteers helped where needed. 1983 brought the long-awaited opening new of the Zooper Market Gift Shop and the Discovery Center, with displays of hatching chicks and a honey bee colony. A survey of area school children determined the theme for the zoo’s next major addition, the Australian Adventure. More than $2.5 million was raised to build the exhibit, which was the largest display of Australian animals outside of Australia. The opening of the Australian Adventure in 1987 was the crowning event of the year. The zoo broke all attendance records, and received a prestigious award from the professional zoo community. In the early 1990s, the Fort Wayne Children’s Zoo received a flurry of national recognition and accolades. Mentions in Cosmopolitan magazine, the New York Times, Child magazine, ABC’s Good Morning America, and the ZooLife television show brought unprecedented publicity to the zoo. In a survey, zoo visitors rated their zoo experience 9.6 out of 10. The zoo generated more than $14 million annually in tourism dollars for the community. Conserving endangered species has always been a priority for the zoo. In 1990, the zoo sponsored a project in Indonesia’s Mentawai Islands to protect five species of rare monkeys and apes. Nearly 15,000 students helped raise funds to “adopt” an acre of rain forest. From this project came the idea for the zoo’s next major expansion: the Indonesian Rain Forest exhibit. 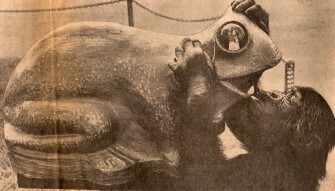 Zoo officials unveiled plans for the new display in 1992. Within a year, the zoo had raised $5.5 million. The Australian Adventure amazed visitors with its dugout canoe ride and walk-through kangaroo yard when it opened in 1987. 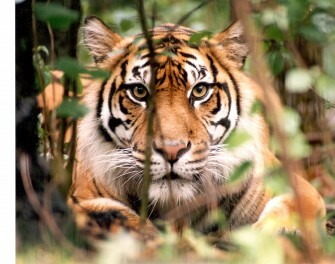 Sumatran tigers came to the zoo in 1996 as part of the new Indonesian Rain Forest exhibit. The first phase of the exhibit, a domed rain forest jungle, opened in 1994. Orangutan Valley, the second phase, opened in 1995, followed by Tiger Forest in 1996. Interest in the zoo soared, and attendance topped 540,000 visitors. The zoo again was honored with awards from professional colleagues. The late 1990s saw a new animal display every year – warthogs, worms, a bird of prey show — growth in education programs, increased involvement in conservation efforts, and more than 10,000 families in the Zoological Society. Veteran zoo employee Jim Anderson took over as zoo director when Earl Wells retired. The zoo covered 38 acres, housed more than 1,500 animals and employed 45 people year round, with another 100 workers added in the summer. In 1998, the Heart of the Zoo Capital Campaign set out to revitalize older areas of the zoo, add new attractions, and improve visitor service. A new paved parking lot was constructed in Franke Park. The tiny veterinary clinic was replaced by a brand-new building on Wells Street. In 2001, the popular Contact Area and goat yard were replaced by a brand-new Indiana Family Farm exhibit. In this unique display, two fictional children lead visitors through a traditional midwestern family farm that might have existed in the middle of the 20th century. In 2001, a new tradition was launched: the Zoo to You TV show. Each Saturday morning, the show takes visitors behind the scenes at the zoo to see how the animals are cared for. The show gained instant popularity with zoo fans all over northeast Indiana. 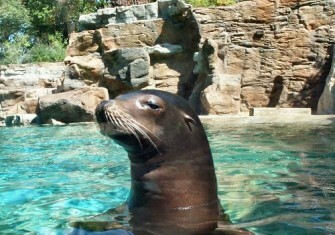 In 2002, the 30-year-old sea lion exhibit was demolished and replaced with the state-of-the-art Sea Lion Beach exhibit. Daily behavioral training sessions are one of the zoo’s most popular attractions. To keep up with the many projects in the works, the zoo hired a full-time Development Director. An annual gala fundraiser, called Zoobilee, as well as sponsorship opportunities and corporate partnerships, help provide funding and support for the zoo’s growth. 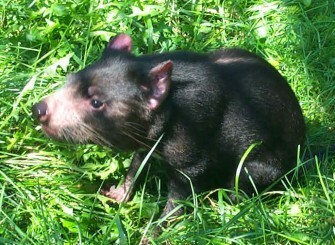 A Tasmanian devil named Coolah helped the zoo gain international fame in 2004. Coolah was the last Tasmanian devil in the world residing outside of Australia. When Coolah died in 2004, zoos and devil fans from around the world expressed their condolences. Sea Lion Beach was renovated in 2002 and is the site of popular daily feeding demonstrations. Coolah the Tasmanian devil helped the zoo gain international fame in 2004. Sharks, rays, and jellyfish were a highlight of 2004. This new exhibit included two new tanks for jellyfish and a 50,000-gallon aquarium for black-tipped sharks. The sharks shared top billing with three Sumatran tiger cubs born on April 22. That same year, the zoo was named one of the “Top Ten Zoos for Kids” by Child magazine. In September 2006, the zoo announced plans for its most ambitious project to date: A complete renovation of the 30- year-old African Veldt. The new exhibit, called the African Journey, includes African lions, hyenas, mongoose, and many other species never before exhibited at the zoo. The first phase of the exhibit, the Sky, Safari, opened in spring 2007. The Sky Safari replaced the popular zebra-striped Safari Ride as an important revenue source for the zoo. The African Journey’s grand opening in 2009 brought unprecedented publicity to the zoo. Parents magazine named the zoo one of the nation’s “Top Ten Zoos for Kids.” More than 613,000 people visited the zoo in 2009, far outpacing the previous record of 540,000 guests in 1994. Bill the lion, the giraffe feeding station, and a set of African drums quickly became visitor favorites in the African Journey. Early in the 2014 season, zoo officials announced the latest major renovation – The Australian Adventure’s three-phase remodel. Phase I included a facelift to the Australian Adventure Plaza complete with new outdoor dining and guest amenities. Phase II will open in 2015 and features the new Stingray Bay and upgrades to the Great Barrier Reef Aquarium. The Outback will be renovated in Phase III of this $7 million project, completely funded by donations from businesses, foundations, and individuals. The zoo earned several impressive accolades in 2014, including TripAdvisor’s “Traveler’s Choice” award, the Northeast Indiana Sustainable Business Council’s Sustainable Business of the Year award, and the Allen County Solid Waste Management District’s Excellence in Recycling Award. In 2015, the zoo celebrated its 50th birthday by thanking the community for its unfailing support through the years. Community support has been integral to the Fort Wayne Children’s Zoo’s success. Bringing people close to animals and fostering an appreciation of wildlife has been the Fort Wayne Children’s Zoo’s mission – from its humble beginnings as a nature preserve to its current status as a world-class zoological facility. Lions Bill and Ina became instant celebrities when the African Journey opened in 2009.